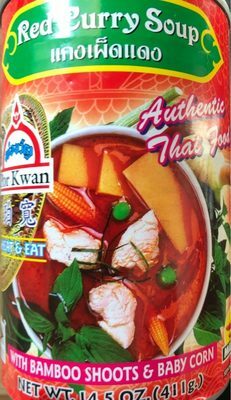 Por Kwan, Red Curry Soup - Nr Instant Produce Co. Ltd.
Brands: Nr Instant Produce Co. Ltd.
Coconut milk, water, bamboo shoots (14%), red curry paste (garlic, lemon grass, red chili, shallot, salt, galanga, kaffir lime peel, coriander, pepper, cumin), baby corn (5%), sugar, salt, sweet basil leaves, kaffir line leaves. Product added on March 9, 2017 at 2:16:20 PM CET by usda-ndb-import. Last edit of product page on October 6, 2018 at 4:33:37 PM CEST by .